If you are reading this post, chances are you’re a person who strives for, or is dedicated to, excellence in their life – something that we at D-Toxd aim for in all that we do. We believe that everyone is here to do amazing things in their lives, to be the best that they can be and change the world in their own unique way. There is something deeply satisfying and fulfilling when you overcome a challenge you once thought was impossible of crazy, or when you look back on your life and see how much you have grown. So today, we would like to share 38 simple tips to help you excel in your life, and we challenge you to implement them in your daily activities. Make the decision every day to do the best that you can, regardless of the outcome. As long as you can get into bed at night and say to yourself “I did good today” then you have had an excellent day. Get healthy. So many people wonder why they do not get great results in their life whilst they neglect their physical health. No matter how hard you work or what type of mindset you have, if you do not take care of your health, you will get nothing at the end of the day. Give yourself permission to make mistakes – they are, after all, the best way to learn. Give up comparing yourself to other people – you are your own best judge. How other’s choose to live is their decision, not yours. Find yourself a personal hero who inspires you to do great things with your life. Give your time to a charity of your choice – sometimes, life is about giving back, and not just in financial ways either. Regularly review your goals and aspirations, monitor your progress and adapt your approach if need be. If you are serious about excellence, be persistent. Excellence means never giving up but it does sometimes mean doing things differently. Learn a foreign language and open up new pathways in your neural network, thereby getting you to think in different ways. Take responsibility for your life no matter what situation you are in. Stop blaming others for the results you have – you are the architect of your life, nobody else. Excellence is designing your own building and inviting others to come and help you build it. Be selfish every now and then and take time out just for yourself. Once you have set yourself a goal, forget about the outcome. If it is in line with everything you value in your life, you will achieve it. Stop focusing on the result and enjoy the journey. Be realistic – if you want to do huge things with your life, start achieving little things first. A skyscraper is built one floor at a time and on deep foundations. How strong is your foundation? Meditate every single day for at least 20 minutes. If you can’t spend this much time on yourself, how can you expect to be there 100% for other people and for your dreams? Forget about being comfortable. Excellence is about doing things outside of your comfort zone. Learn to listen to your heart – it will only ever tell you what you need, rather than what you want. Learn how to manage your time – this is something that every person has. Maximize your time, you excel your results. Never assume. Always ask ! Get breathless every day – exercise for at least 15 to 20 minutes a day to the point where you are slightly out of breath but can still hold a conversation. Appreciate what you have right now. If you don’t accept and appreciate what you have in your life today, how can you ever expect to be able to accept and appreciate more. Until you learn to appreciate everything going on around you right now, things will not change regardless of how hard you work. Work in line with your personal values – excellent things happen when you do this. No matter where we are, we will always tell you this. Drink at least 2 litres of water every single day – it spreads excellence to every part of your body. Wear other people’s shoes every now and then – when you find yourself angry or frustrated with someone, put yourself in their shoes for a few minutes. Having compassion often turns things around in ways you could not imagine. Stop looking for apples on an orange tree. If you are not getting the results you would like, maybe you are looking in the wrong place. Treat your mind like a garden. Water in regularly. Weed it regularly. Nourish it. Nurture it. Sow new seeds. Look after it and beautiful things happen. The Law of Attraction is not the only law out there you know. And besides, attraction ends with action, so take action ! Listen to people when the talk, don’t just hear what they say. There is a slight difference so try it. Get yourself a Nike product just so that you are reminded of their slogan – JUST DO IT! Stop endless planning and get going. Do a SWOT Analysis of your own life. Find out your personal Strengths and Weaknesses, Opportunities and Threats. So often, we forget about this and think we can do everything on our own. Stop trying to be someone else and just be you. That is what you were born to be. Remember that you are a human being and not a machine. Work as part of a team – it is the greatest way ever to learn anything about yourself. 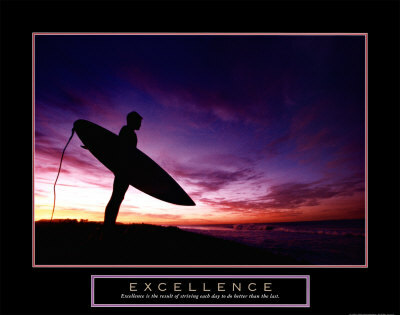 Excellence is choice you make every single day. It is not a habit, it is a way of life – there is a huge difference here. Write down every single fear you have in your life and face them once and for all rather than having them lurk around in the dark corners of your mind. Find yourself a mentor – someone who has the results you would like to achieve. However, there is a difference between a mentor and a coach. Get yourself a coach – someone who can work on YOU and the foundation upon which you build everything else. Without this foundation in place, there is no point in working on the other areas. ** This blog was written by us some time ago – we’ve been doing some updating and now transferring it across to this blog.